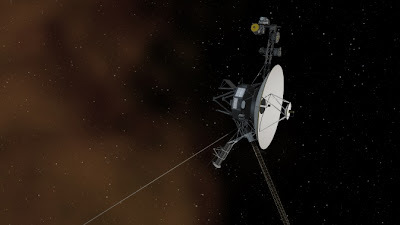 Voyager 1 is a 722-Kilogram space probe launched by NASA on September 5 1977 to study the outer Solar System. It’s is a First Manmade object from Earth to reach the Interstellar space. The 36 year old Space probe travelled 12 billion miles from our sun. Voyager1 has been travelling for about one year through plasma, or ionized gas present in the space between stars. NASA has received the Signals from space probe and they are analyzing on the data. 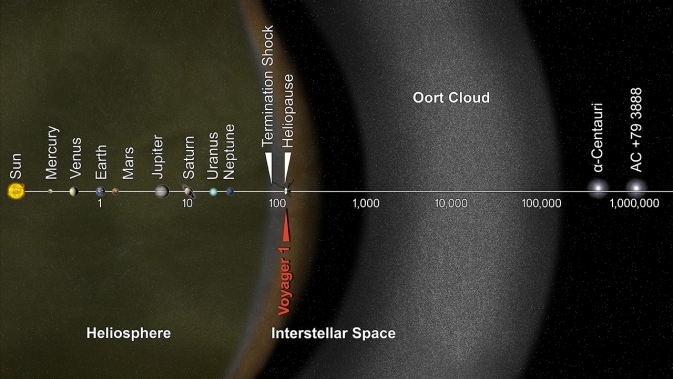 To Understand More, Let us discuss about Heliosphere & Interstellar Space. Heliosphere is a region of space dominated by the Sun, a sort of bubble of charged particles in the space surrounding the Solar System. These particles are "blown" out from the sun by the solar wind and into the interstellar medium, the hydrogen and helium gas that permeates the galaxy. Although electrically neutral atoms from the extra-solar volume can penetrate this bubble, virtually all of the material in the heliosphere emanates from the Sun itself.